One of my professional development goals for this three-year, re-certification cycle is to spiral coverage of various Social Studies topics, so that they keep coming up again and again, thus impressing themselves on 7th and 8th grade students, who would rather devote their brain cells to more urgent things, like tacos, cat videos and fart jokes. As part of the notes I gave my 8th graders, while we were studying the Civil War, I covered some of the technological advances during the war, including the introduction of rifles, iron-clad battle ships and the Gatling gun. 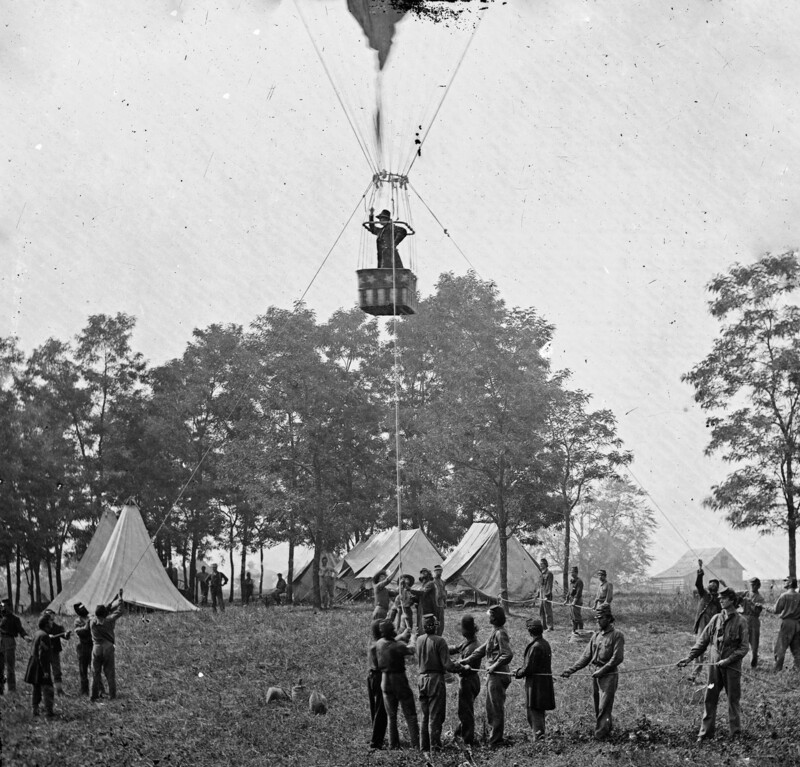 Because we are a New Hampshire school, I included the use of hot-air balloons by the Union Army. (Most of the notable balloonists of the period were from New Hampshire.) I pointed out that using balloons for observation led almost directly to the use of blimps and dirigibles half a century later in World War One, which led to the use of fighter planes and bombers, which led to modern air warfare. This was all well and good - if a bit over-simplified - but probably didn't make much of an impression on most of my students. I like it when stuff like this works out. Is there such a thing as a good war? Does violence ever solve anything? What would you be willing to kill somebody for? This year, my students were very resistant to digging deeply into any of these questions. Q: Is there such a thing as a good war? A: "Yes." "Yes." "I don't know." "Maybe" "Probably"
What is a good war? When does violence solve problems? What would you would be willing to kill somebody else for? A good lesson for me. As always, their answers were really interesting, if you compare them to what a Civil War-Era Southerner might have said. One of my goals for my 8th grade American History classes is to foster a spirit of introspection. In one sense, that's easy - you'd have to look really hard for anyone outside the world of show business more self-centered than a fourteen year-old. Okay - on second thought, fourteen year-olds aren't any more self-centered than most of us. Which makes it even more important to get them in the habit of examining their beliefs from time to time and seeing how they stack up against a larger framework. One way to get a conversation going is to use a tried-and-true classroom technique - the Chalk Talk. The idea behind a Chalk Talk is that the teacher - me, in this case - writes one or more questions - preferably provocative ones - on the whiteboard in my classroom. Students write responses to my prompt and respond to each other's responses. They are not allowed to speak while they do this - all communication is supposed to take place on the board. In theory, this all takes place in silence, but I actually like to play appropriately-themed music while they do this.